The RV -The latest in our quest for the ultimate “Domesticated” design. The RV is exactly as its name implies… A “Recreational Vehicle”. Designed for extracting maximum fun with minimum effort and ease of exploitation of your precious free time. If you want to cruise the coast in style and comfort, surf in a resplendent state of wave catching excess and bliss, then the R.V. is for you. The design stems from a blend of the Bottom Feeder/Couch Potato/Lay-Z-Toy genre. The vee negates the substantial volume and allows easy rail to rail transitions on wide, thick boards with a lot of surface area. Noticeable updates include the double wing flyers added to the tail, to reduce surface area and increase bite and precision in turns. The reduced surface area adds confidence of not sliding out in hard snaps, and carves. 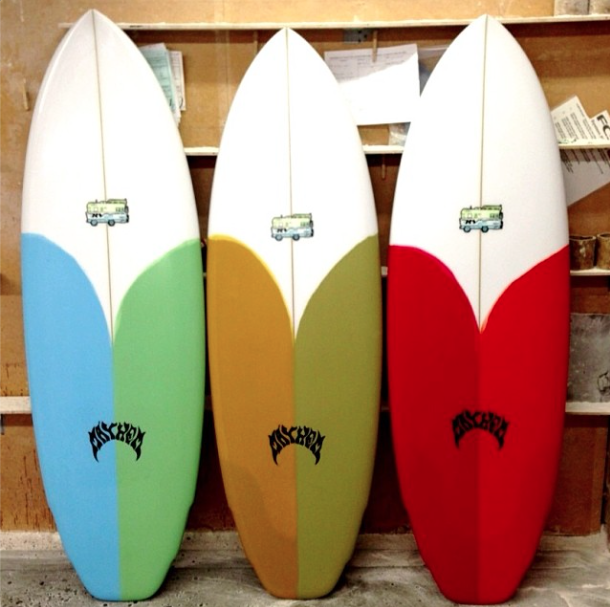 The nose outline has also been tweaked to reduce some are in the forward 12-18″ of the board, but without reducing drive down the line or paddle ability. THE RV – NATE YEOMANS from Lost Enterprises on Vimeo. Demonstrated by Nate Yeomans (and one wave of Ian Crane). Video by Jacob Vanderwork. Mason Ho holding a custom 5’2″ RV with his signature shoe art from Etnies on it. Not sure what happened to Mother Russia. Must be part of the sanctions.